Settling into my new home in Western Washington, I was surprised how many houseplants grew outside and not as annuals. I grew up in cold South Dakota, where houseplants were very important. 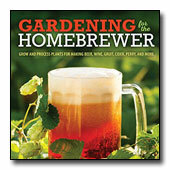 I also lived in the Eastern U.S.; there many houseplants were grown outside as annuals. Settling into my new home in western Washington, I was surprised how houseplants were grown outside as annuals. Settling into my new home in western Washington, I was surprised how many houseplants grew outside and not as annuals. After experiencing a full year, I understood more about why some houseplants can grow outside. In the Pacific Northwest the climate, although chilly has temperatures that are generally above zero, and subzero or below zero refers to Celsius, not Fahrenheit. English ivy (Hedra helix) is so successful, I think of it as a houseplant gone wild. English ivy gone wild is not a good thing. For example, in my new garden the ivy formed a contorted stump with stems two inches in diameter and was taking over. 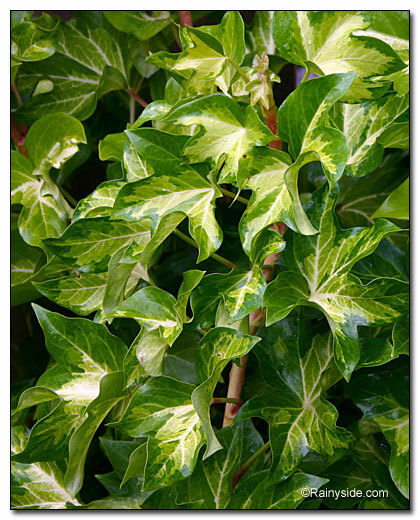 In addition, the ivy often escapes from cultivated areas into the wild and is a serious pest in the Pacific Northwest. English ivy, in addition to being a thug outside, is not necessarily the best houseplant for our homes either. Modern houses tend to be too dry and warm in winter for Hedra helix. These conditions encourage attacks by spider mites, and leaves end up with brown, dry tips. During Victorian times, houses were often cool and drafty and ivy thrived. Many of the other houseplants that we can grow outdoors successfully, such as Abutilon megapotamicum, Aspidistra elatior, Aucuba japonica, Fatsia japonica, xFastshedera lizei, Laurus noblis, Osmanthus heterophyllus, Tolmiea menziesii, and Saxifraga stonifera also thrived in Victorian houses. In modern homes, efforts made to keep them cool, about 50° F, will result in success. I will talk about each of the houseplants I just mentioned and how well they do outdoors, including a houseplant that will thrive both outdoors and in our modern, warm houses Soleirolia soleriolii. Abutilon megapotamicum or flowering maple and its hybrids are some of the hardier ones to grow outside in USDA zone 8, (7 with protection), Sunset zones 8, 9, 12-24 H1, H2. Abutilons bloom on new wood so, although in cold winters there will be dieback, the shrub regenerates from the base, flowering during the summer. One way to tell you have A. megapotamicum is its calyxes are red and extended, with yellow petals just peaking out, resembling Chinese lanterns. Many of its hybrids, such as A. x milleri, still have the inflated calyxes but are selected for other colors besides red. Aspidistra elatior, the cast iron plant of Victorian parlors, is a tough plant for tough conditions, as long as those conditions are in the shade. This evergreen, two to three foot groundcover does well in dry shade or well drained soil in our northwest climate. The straight species is hardy to USDA zone 7, Sunset zones 4-10, 12-24. Some cultivars are a bit less hardy but still very adaptable to our climate. Aucuba japonica is known as spotted laurel. The gold speckles are unique but I am fond of the subtle green-leafed female cultivars, such as ‘Salicifolia' or the self-fertile ‘Rozainie' that sports red berries late summer into fall. For spotted foliage and berries, ‘Gold Dust' is a good cultivar. Heights of individual cultivars vary, but in general spotted laurel grows ten feet tall and about half as wide. All the above cultivars of Aucuba japonica are evergreen outside and hardy outdoors in USDA zone 7, Sunset zones 4-24. Fatsia japonica (Japanese aralia) and xFatshedra lizei (tree ivy) are very similar because xF. lizei has F. japonica in its parentage. Tree ivy is actually a very unusual cross between Japanese aralia and Atlantic ivy. From Fatsia japonica, x Fatshedra lizei becomes more tree like than ivy and has larger leaves, seven inches more than an ivy, but not the foot across of the Japanese aralia. Tree ivy is a bit smaller in height than Fatsia japonica as well six feet instead of 12 feet or more. Both have green and variegated cultivars and are quite hardy. Both tree ivy and Japanese aralia are hardy USDA zone7, Sunset zones 4-10 12-24 H1,H2. The cook will be familiar with Laurus nobilis or bay laurel which although having the potential to grow 40 feet tall, is very narrow, at about ten feet wide. Successful culture of bay laurel inside and out relies upon well drained soil that is not wet during the winter. Hardy in USDA zone 8, Sunset zones 5-9 12-24, H1,H2, it is a great evergreen tree to add to a small garden, since it is narrow. A houseplant replacement for holly at Christmas is Osmanthus heterophyllus, or false holly. False holly unlike true holly (Ilex aquifolium) is not weedy outside and is more adaptable as a houseplant; however, it still needs cool conditions indoors. False holly's slow growth and small size, usually under 12 feet (though some really old specimens can be 20 feet) are a great asset to a small garden in USDA zone 7, Sunset zones 4-10 14-24. The cultivars of false holly are numerous and for those with time and forethought, it would make a great hedge. Tolmiea menziesii or Piggyback plant is actually a native to the Pacific Northwest. An adaptable houseplant, it thrives outside in the shade growing about 18 inches tall. As a groundcover, it spreads by plantlets formed on its leaves, hence the name piggyback plant. The straight species is hardy to USDA zone 6, Sunset zones 4-9, 14-17, 20-24, and is the most commonly grown, but two gold leaf cultivars are available—‘Taff's Gold' and ‘Cool Gold'. A houseplant with the confusing common name of strawberry begonia, Saxifraga stolonifera, although having runners like strawberries, and flowers slightly begonia-like is not closely related to either. Saxifraga stolonifera is more closely related to our native piggy back plant. Like the piggyback plant, it is also a groundcover, a bit smaller at 12 inches tall and very adaptable. It does best in well-drained, moist soil but likes either sun or shade. In shade it will handle a bit more dryness, though, and is hardy to USDA zone 5, Sunset zones 2-9, 14-24. Baby tears, (Soleirolia soleirolii) thrives in modern houses but also outside; the key is moist soil. Although baby tears' small height, about four inches, provides a Lilliputian mat, it does grow aggressively. Be warned, it can easily cover a large area. The small green leaves lend a fine texture to the garden; for even more interest, there is a golden cultivar ‘Aurea' and a white variegated one ‘Argentea'. The species and the cultivars are hardy to USDA zone 8, Sunset zones 4-24 H1, H2.